In the last year or so, Collabora has been working with the Raspberry Pi Foundation on a web browser and on Wayland. See Daniel’s and Pekka’s blog posts about their Wayland work. To make Wayland on the Raspberry Pi actually usable, we needed a shell, but lightweight desktop environments (like LXDE) don’t support Wayland and normal desktops (like Gnome and KDE) are just too heavy. This meant we ended up writing our own shell based on Tiago Vignatti’s gtk-shell, so Maynard was born! Maynard is far from complete, but it’s already starting to take shape nicely. Its goals are to be functional, light and pretty, so it will never see some of the features one might expect from Gnome or KDE for instance. No XWayland support, so non-Wayland applications cannot run (issue #1). GTK applications take too long to start (issue #2). Active apps are not shown in the panel (issue #3). 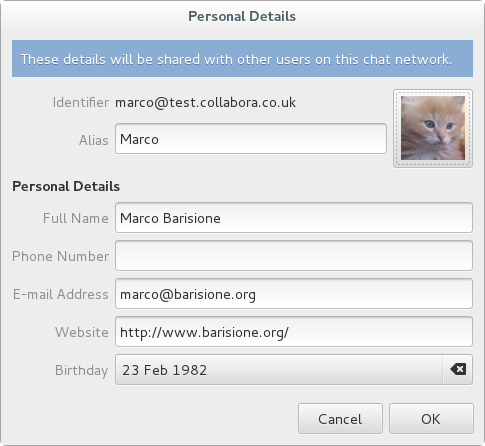 Two years ago the first version of GNOME Online Accounts (GOA) was released and Empathy got the ability to use the GOA accounts that supported chat. This feature was a bit incomplete as you could configure Google and Facebook accounts in the control center (through GOA), but the other accounts could only be configured directly in Empathy. Similarly, you could use, but not modify, GOA accounts in Empathy. This problem was not fixed before as it required a lot of work, even if (from a user point of view) it was just a matter of moving some UI around. In the last month at Collabora I worked hard on fixing this issue (and it took more than 160 patches in several components) and now you can configure every type of IM account in the control center. All of this was done without breaking compatibility. If your program uses the Telepathy API nothing will change; if your program uses the GOA API then it will also able to handle Telepathy accounts. This was also a good chance to fix several UI issues (mainly misaligned widgets and too much/too little spacing between widgets), see what the old UI looked like. The task is not 100% finished yet as Empathy still opens its own accounts dialog instead of the control center and there are also a few other UI improvements to make. Thanks to Emanuele for starting the job, Rishi and Guillaume for the help and the reviews, Allan for the designs, and Intel for sponsoring the bulk of the work. I uploaded new versions of my two extensions (Message Notifier and Boss Mode) to extensions.gnome.org. To update, just visit the extension pages and click on the update button next to the on/off switch. Sorry if it took a while, but Debian (even unstable) is still using Gnome 3.4. I read a few good articles in English about the latest elections in Italy, but they all seemed a bit unclear about what can actually happen and what cannot happen. I hope this post can be easy to understand, not too boring and not too imprecise (I’m trying to simplify a few things and I didn’t study law). Italy is a parliamentary republic. The parliament is formed by two separate houses, the chamber of deputies and the senate. The two houses have the same powers to make laws and to pass votes of confidence for the government. The cabinet is usually formed by members of the parliament, but this is not a requirement. The prime minister is not particularly powerful, for instance the prime minister cannot dismiss ministers or call for new elections. The president of Italy is the head of state. The president is mainly a figurehead with limited powers, but becomes very important when it’s time to form a new government or to dissolve the parliament. The president is elected by a joint session of the two houses of the parliament plus 58 local representatives for a 7-year term. How is the parliament elected? The current electoral law, disliked by almost everybody, was used for the first time in 2006 and was designed to make it difficult for the left to get a stable majority. Parties can form coalitions or stand on their own. For the lower house, the coalition or party with the most votes automatically gets 55% of the seats. The rest of the seats are assigned to the other coalitions or parties on a proportional basis. The senate is elected in a similar way, but on a regional basis (Italy is formed by 20 regions). This means that the party or coalition that gets most of the votes in a region gets 55% of the seats assigned to that region. It means that, at a national level, it’s possible that nobody will have a majority. What are the main parties/coalitions in Italy? The left is formed mainly by the Democratic Party (a center-left social democratic party) and by Left Ecology Freedom (a communist-ish/green party). The centre is a mix of Christian and economically liberal parties. Its leader is Mario Monti, the current technocrat prime minister. The right is formed by Silvio Berlusconi‘s People of Freedom and by the Northern League (they want more independence for the North of Italy and they are a bit populist and racist). The new entry at the latest elections was Beppe Grillo‘s Five Star Movement. Their policies are a mix of environmentalism, anti-corruption and euroscepticism. While most of their goals are laudable, they are very populist with huge holes in their policies; basically it’s not clear where they could get the money for any of their policies. While they claim to value direct democracy, it’s Beppe Grillo who actually completely controls the party, even if he was not a candidate at the elections. Why isn’t Beppe Grillo in the parliament? Beppe Grillo says he is just the spokesperson of his party. Moreover, the Five Star Movement is against electing people that were found guilty of any crime in the past and Beppe Grillo was found guilty of manslaughter for a car accident in which three passengers died. Nobody. The left has a majority in the lower house, but no current coalition has a majority in the senate. Who voted for the 5 Star Movement? Apparently one third of their voters used to vote for the left, one third for the right and one third didn’t vote in the past. The new parliament’s term will start in a couple of weeks. At that point the two houses need to vote for their presidents/speakers. Then the Italian president will hold meetings with the various political leaders and try to find a prime minister that has good chances of creating a cabinet that could pass a confidence vote by both houses of the parliament. This is the problem as there is no majority at the moment. Is a broader coalition possible? In theory yes. Any coalition will have to include the left because they control the lower house. A coalition of the left and the centre is what most people expected before the elections, but Monti didn’t get as many votes as expected, so this coalition would not have a majority in the senate. A coalition of the left and the 5 Star Movement would have a majority, but Beppe Grillo doesn’t want to form alliances with anybody. The 5 stars are against traditional politics and want a deep renovation of the Italian political class; if they decided to form an alliance with a traditional party they would lose a lot of their voters. A coalition of the left and the right is possible too, but unlikely. The current technocrat government was, after all, a coalition of left, centre and right, but Berlusconi decided to stop supporting it, so why should he be trusted again? Moreover, I think that a coalition of left and right would disgust a lot of their voters. Is a minority government possible? It would be very unstable but yes, it would be possible to have a minority government formed by the left and, maybe, the centre with external support by the 5 stars. The problem is that this cabinet would still need to pass a vote of confidence in the lower house (easy) and in the senate (not so easy as the 5 stars don’t want to vote for it). But the 5 star senators could just abstain, right? No. Abstentions in the senate count as no, so the government would not get the parliament’s confidence. But the 5 star senators could just leave the senate during the confidence vote! No. Votes in the senate are only valid if the majority of senators are present. The right would not have enough votes to block the confidence vote, but they could just leave before the vote, making the vote invalid. Can’t you just vote again? Usually the president, when it’s clear that there is no chance to form a cabinet, calls for elections, but this time it’s not possible. The authors of our constitution were worried that a president could dissolve the parliament just before the end of the presidential term in the hope of getting a more favourable parliament that would elect the current president for another term. The term of the current president will end in a few months, so he cannot dissolve the parliament now. How about another technocrat government? It would be possible (and it would be very different from the current one!) but it would be very difficult to get the left and the 5 stars to agree on much. Could the new parliament elect another president that would then dissolve the parliament? Yes, but finding an agreement to make this happen is going to be complicated and take time. In the meantime, Italy won’t have a stable government (the current Monti government will be in charge until a new government is found, but with very limited powers). So, what is going to happen? Good question. I have no idea. Yesterday I was discussing a bug in some code using a GHashTable with Will and we both started to wonder if there is any reason to use g_hash_table_insert instead of g_hash_table_replace. First of all an example, look at this code and try to find the bug. If it’s not clear where the bug is, try invoking the program with “apples=42 Pears=12 APPLES=10” on the command line. If a key already exists in the hash table, the key passed to g_hash_table_insert is destroyed and you cannot use it afterwards. This behaviour is documented, but it’s easy to find code affected by this bug. g_hash_table_replace behaves like g_hash_table_insert, but without this problem. Is there any good reason for using g_hash_table_insert instead of g_hash_table_replace? Can you come up with a non-contrived example where you want the behaviour of the former? 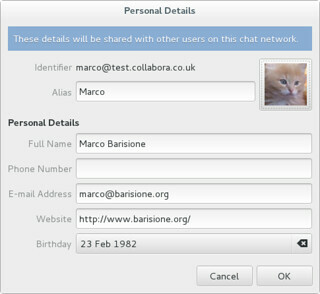 Recently I didn’t have much time to hack on Message Notifier, but luckily Guillaume Desmottes ported it to Gnome 3.6. This version also changes the shortcut to open the menu from Win+M to Win+L, as the former is now used by the shell. To update, just visit the extension page and click on the update button next to the on/off switch. Gnome-shell’s popup notifications and integrated chat are great, but sometimes I’m annoyed when the content of a chat is displayed on screen at the wrong moment (for instance if a colleague sends you a work-related message while you are sitting at a conference next to other people). The Boss Mode extension allows you to quickly disable notifications, without any UI feedback, by just pressing Win+B. Press Win+N to enable notifications again. The default keybindings can be modified by clicking the preferences button on the extension page (next to the switch to enable/disable the extension).